Thanks to the band Powerwolf, every time I drive by one of the local Catholic churches in my home city, I can’t help but think that it would be perfect if they were to perform inside one. Not to be preaching about the “good news”, but to be rocking out upon the altar, singing about religious tales done in the most dark and ironic of manners. I guess one of the reasons Powerwolf is so appealing to me is the fact that I grew up in a very Catholic oriented family, and seeing a band with a dark imagery conveying this look was something I could easily find humorous and easy to get into since falling out of religion in my teen years. Blood of the Saints was indeed an extremely enjoyable album and I was hoping to be able to experience a similar album. Essentially this album does feel the same (Blood of the Saints still being my favorite), but there is still an outstanding collection of songs here to be heard. If it isn’t broke, don’t fix it right? The werewolves unleash from the wild pretty quickly with their furious opener, Amen & Attack. 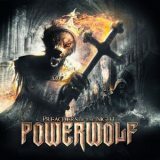 It has a very similar opening compared to their last album, containing heavy guitars, hardened double bass, and a church sounding organ to make Powerwolf’s first track one killer starter. The album this time around feels a bit more “power metal” at times, as the second track, Secrets of the Sacristy, clearly shows more than the rest. It has a more upbeat feel to the music overall, but the album is no less dark. Coleus Sanctus begins with a very shadowy and sanctified beginning which includes one killer chorus that’s hard to not feel pleased with. A lot of the tracks are really hard to be disappointed with, as each track slowly gets better one after another especially during the first half of the album. My personal favorite, Sacred & Wild is no doubt the most likable of all the tracks. It was particularly hard not to blast this song to my speakers’ full volume capacity. The same goes for the following track, Kreuzfeuer, as this time around the song is sung in full German but is no less striking. It is undeniably one of the most head bobbing songs on the entire album. At this point into the album, I couldn’t be happier with Attila Dorn’s vocal performance. For someone who studied classical opera, he melds just perfectly with this band as well as the dark and shadowy church sounding choirs that accompany much of his recordings on this album. Cardinal Sin (yet more religious humor) begins with an epic vocal performance from the man, and jumps once again into a track with bit more focus on guitar leads which were performed very appealingly. In the Name of God has a typical religious theme most are accustomed with which includes a promise of heaven only if we uphold God’s holy crusade with violence by the sword. One interesting thing that Powerwolf is fun to look into is their lyrics. As I said from the start, much of it is either delving into dark religious tales filled with much irony or stories about vampire and werewolf legends. Altogether, they have combined both very well, especially with their last two album covers, as they are some of my favorite artwork covers in recent recollection. The album gets more orchestral sounding with the track Nochnoi Dozor, in which its opening sounds fitting for a movie soundtrack. Probably one of the heaviest tracks on the album, it also contains Attilas Durn’s most haunting sounding vocals towards the songs end. The album ends with the song, Last of the Living Dead, which focuses on ending slower than I anticipated it too. It has some “battle ready” sounding drums and also great vocals to end the album in a great style. The song is over seven minutes long but don’t be fooled. After about the four minute mark, the song dips into an ambient sound of storms and the hollowing of wolves in the nearby distance. This is truly yet another exceptional effort by Powerwolf. If you have just discovered this band, this is certainly a worthy place to start listening. The more you get into their albums, the more fun and entertaining they become. Their music has definitely grown on me over the last few years and I will be excitingly looking forward to what more they have in store for the future.